We are well known manufacturer and exporter of the metal containers. We supply different kinds of metal containers with variety of configurations. Our metal containers and stillages are made from high grade material considering overall storage need and conveniences of users. Bearing in mind the requirements of users we offer a great range of metal containers depending upon the applications. 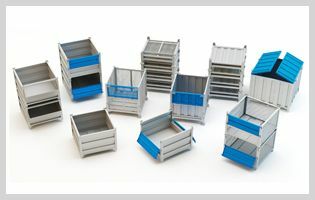 Our metal containers are ideally used to hold the diverse products. They are like a box. So preferable used for vast range of the products for holding and transporting with safe and sound manner. It is also preferred for the unusual shaped products to keep and transport them. Metal containers and stillages are fabricated from finest quality of steel sheet. These reinforced sheets provide strong base to containers. Rigid welding helps to build robust and long lasting construction of metal containers. Our cost effective range of metal containers helps most to keep difficult products with damage free and convenient manner.